Whoa! That’s exactly the word I thought when I finished reading Deadly Thyme, the absolutely riveting and action packed new book by R.L. Nolen. Follow the story of protagonist Ruth Butler as she flees Texas and her abusive husband to protect her baby daughter, Annie. They manage to live a careful, but safe life for ten years in Perrin's Point, a seaside village in the south of England. But when Annie goes missing, and most suspect, and for good reason, that she has been kidnapped and killed by a serial killer, Ruth’s idyllic life is shattered. Ruth refuses to believe that Annie is dead, and finds an ally in Inspector Jon Graham, seemingly the only person willing to help her find her daughter. Challenged by their circumstances - Ruth is living under an alias and needs to keep her whereabouts a secret, and Inspector Graham needs to keep his identity a secret so as not to blow his cover in another case - the pair desperately search for Ruth’s little girl, and can only hope they won’t be too late. I loved this book. Loved. It. Mysteries are some of my very favorite books, but I find that I can often solve them quite quickly, only finishing the book to find out if I was right. Not so with Deadly Thyme. Author R.L. Nolen’s work had me sucked in from the very beginning, and I simply could not stop reading until I reached the very end, with not a clue as to who the villain might be. R.L Nolen has done a great job in creating interesting characters, great scenes, and a simply exciting and thrilling read. Any reader who enjoys mysteries, action, adventure, thrillers, suspense or just a great read in general would love Deadly Thyme. I highly recommend this book, and also will be adding author R.L. Nolen to my short list of must-read authors. A mother knows things that simply cannot be explained. That is why Ruth Butler refuses to believe her daughter, Annie, is dead. In Deadly Thyme by R.L. Nolen, a clandestine police investigation turns into a hunt for a multiple murderer as the body of a young girl is discovered. This leads to the identification of other missing persons going back many years. Police Detective Inspector Jon Graham tries to quietly slip into Perrin’s Point for an internal investigation, but a fender bender changes that plan. As he takes his place in town, living in a caravan in another officer’s garden supposedly as his cousin on holiday, the mystery heats up. Trying to put the pieces together is difficult when there are so many secrets to hide, but their determination and hard work force the killer into making some mistakes. Is Ruth’s conviction based at all on truth or will Jon discover that the worst has, in fact, come to pass? Hauntingly beautiful scenery and seaside charm provide the setting for Deadly Thyme by R.L. Nolen. A quaint village in Cornwall is the final resting place for a number of victims of a serial killer with unresolved issues. With new discoveries at every turn, this mystery keeps you turning the pages, anxious to find out what happens next when so many people are not who they seem to be. Nolen uses the history and geography of the area to great advantage and captures the ambiance of the small town as the ‘outsider’ tries to make sense of what is going on. Deadly Thyme is an engrossing mystery novel by R.L. Nolen. Former Texan Ruth Butler relocates to Perrin's Point, England, after an empowered break from her husband in a bid to protect Annie, her beloved daughter. A decade passes and Ruth and Annie settle into their new lives, until the fateful day when Annie suddenly vanishes. Unable to investigate openly and risk deportation, Ruth enlists the help of Detective Inspector Jon Graham who is in the area on an unrelated case. The search for Annie leads the duo to gruesome finds and sinister plots, not least of which is the connection to a bizarre, disturbed soul who fixates on Ruth as a new incarnation of his deceased mother. Fans of small town dramas are sure to be sucked into this little Cornish village, with its creepy caves and bodies washing up on the beach. R.L. Nolen crafts a suspenseful mystery with superb prose, and I was delighted by the way the villain’s herbaceous clues connected with the novel’s title. Flowing expertly and with diligent detectives and unexpected plot twists, I daresay that Nolen is my modern day Agatha Christie, long searched for and finally found. 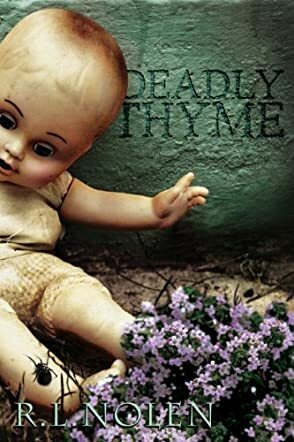 Deadly Thyme is an incredibly compelling read with realistic emotional impact, descriptive attention to detail, and a portrayal of unsettling true evil that will stay with me for quite some time yet. I absolutely devoured this book, and I’d highly recommend it to mystery readers looking for dark drama, well crafted characters and a genuinely surprising and original plot line. Deadly Thyme by R.L. Nolen is a suspenseful fiction story that starts with a beautifully described village, Perrin's Point, in southern England. The cast of well described characters includes single mom Ruth Butler, who brought her daughter Annie to Perrin's Point ten years ago to escape a dangerous relationship with her father. When Annie disappears on the beach one morning, the town believes Annie's playfulness led to her tragic death. But Ruth refuses to believe her daughter is dead. She connects with Jon Graham, an undercover detective who can't help Ruth openly because it might blow his cover. Nevertheless, the two embark on a dark and twisted journey that conjures horrible descriptions of madmen, lunatics, and murders. Ruth believes with Jon's help she can save Annie, but, like the rest of the town, Jon wonders if they have already run out of time. This book was very dark, but also an interesting mystery. The darkness of the mystery and the grisly murders was very intense and will keep readers turning the pages to discover the character's secrets. But the author did a good job of balancing the darkness of the crime and criminals with the engaging and interesting secondary characters and setting. The story depicts beautifully the small English town, the local inhabitants, and accurately describes the police. The characters are all very well described and make this story what it is, a nice balance of funny and interesting with dark and scary. In a highly suspenseful thrill ride of a read, author R.L. Nolen gives her readers a wonderful novel in Deadly Thyme. In it, the reader meets Ruth Butler and her daughter Annie. Ruth fled Texas for a small town in southern England when Annie was just a baby, desperate to escape her dangerous husband. Living under assumed names, Ruth and Annie have managed to create a sense of security in the ten years they’ve lived in sleepy Perrin's Point. But when Annie is kidnapped from the beach one day, Ruth’s life is thrown into an absolute tailspin. And when a child’s body washes up on the shore wearing Annie’s clothes, all assume the little girl has been killed. But the child is not Annie, and Ruth will not rest until she finds her. Enlisting the help of Inspector Jon Graham, a detective who is only in town as an undercover agent working on another crime, Ruth is prepared to do anything to save her child. Fantastic! That is the best word I can use to describe Deadly Thyme. This is a unique and exciting read and will keep the reader guessing to the very end, something that’s becoming more and more unusual in the mystery genre these days. Author R.L. Nolen is clearly a very gifted author, and one who is quite skilled at creating characters and scenarios that will hook her readers and keep them sucked in from the very first page to the last. Mystery lovers and lovers of thrillers or suspense will want to pick up this book, and will probably want to add author R.L. Nolen to their list of favorite authors soon after.